Marcelo Bielsa at West Brom. It was not exactly the way Leeds United wanted to head into another international break was it? Marcelo Bielsa’s men were given a bit of a chasing against a team they are going to have to compete with if they are to follow through with the promising start to the season and actually challenge for promotion this time. The 4-1 defeat at West Brom was something of a wake-up call for supporters who were believing the Whites were going to breeze through the campaign on their way to inevitable glory next May. The Championship has a way of keeping everyone level headed and it was demonstrated big style as United failed to cope with the pace of their hosts last Saturday and could not find a way to better their tactics which basically comprised of pulling the Whites onto them and breaking at speed. For the first time since the Bielsa reign began Leeds were outplayed and their head coach out-thought. In their previous two league defeats they had been unlucky to lose, but there was nothing fortunate about West Brom’s success. 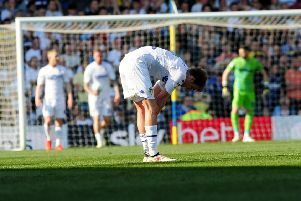 They may well have supplied the blueprint for how to get the better of this Leeds team and it will not have been lost on the Championship managers able to watch the game live on TV how it was achieved. Bielsa took the blame for the defeat and the struggles of the players on this occasion. He said: “I feel responsible for this loss. “We knew the features of the opponent was that they needed spaces to attack. “In order to prevent the opponent from counter attacking we had not to lose the ball when we built out from the back. We worked on this to prevent this from happening. If the opposite of what I designed happened I am responsible for it. But what I could say is the score was a little bit too much. “At times we were the team we normally are, but the opponents scored goals because of what I said. “When I take the responsibility for something it is because I have thought about it, am I responsible for it or not? “We have many ways to avoid the opponent and the way he needs to play. Bielsa now has some time to work with his players before the next match with a week off from playing, although he will be frustrated at not being able to have several of United’s best players with him as they go off to play for their countries.